Bowser with a Dark Cannon. A Dark Cannon (ダークキャノン, Dark Cannon) is a powerful weapon of the Subspace Army. This large, bulky weapon vaguely resembles a black dragon head and has the power to turn characters into trophies in a single shot. After a somewhat lengthy charging period, in which the "mouth" of the weapon glows orange, it fires a thick, black arrow-shaped beam that instantly turns any character it hits into a trophy. The shots mainly move in straight lines but can curve slightly in seemingly random directions; should a shot hit something that cannot be turned into a trophy, it will cause an explosion. Once initially charged up, Dark Cannons can proceed to fire multiple shots in quick succession; the charge time needed seems to lengthen the longer it goes without firing. Wario fires an arrow from his Dark Cannon. Despite its potentially high rate of fire and fast shot speed, Dark Cannons are not very hard to dodge if the target is aware; in fact, the only times the weapon is seen connecting is on targets that are incapacitated or ambushed. They can also only affect one target at a time - once a shot connects, it quickly fades away even if it pierces through the target. As a result, the victim must be quickly taken away from their partners and find a very fast escape path such as the Koopa Clown Car to prevent an easy revival. Dark Cannons are also large and unwieldy; they are too heavy for a normal human to carry, so only those of above-average strength can use one properly. 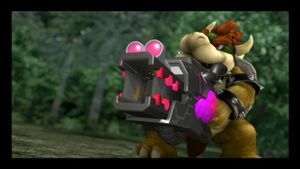 In the Subspace Emissary, Dark Cannons are provided to the field Smasher accomplices of the Subspace Army: Wario and Bowser. Wario uses his to capture either Peach or Zelda from the Midair Stadium, followed by Ness at The Ruined Zoo. Bowser uses his to capture Donkey Kong and whichever princess Wario did not get; shortly afterwards, a false version of this princess attempts to use the weapon on either Mario and Pit or Link and Yoshi as the pair passes by The Lake Shore, but is thwarted by the other pair, who destroy the Dark Cannon. Bowser then procures another Dark Cannon and attempts to capture Fox and Diddy Kong, but Falco interrupts him and destroys the weapon with several Blaster shots. Finally, after the Subspace Gunship is destroyed, Ganondorf uses a Dark Cannon to remove Bowser from the picture in his attempt to seize control of the Army. The Dark Cannon trophy from Brawl. In this world, those who fall in battle return to their forms as trophies. This Dark Cannon is powerful enough to turn a fighter back into a trophy with a single shot. Originally created by the Subspace Army, they were then given to Bowser and Wario for the purpose of collecting fighters who exist in this world. This page was last edited on October 22, 2018, at 23:55.